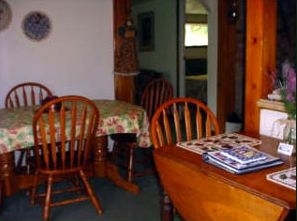 This wonderful cottage has a full kitchen (coffee and selection of herbal teas provided) & modern appliances. 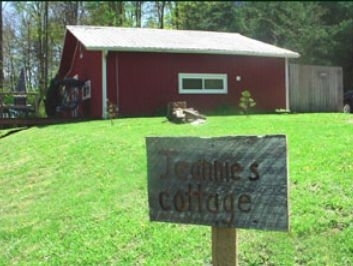 A/C, gas log burner & modern appliances, charcoal grill, 6 person hot tub, 2 bedrooms (queen bed / double bed) plus a double-bed futon, full bath with tub/shower, Satellite TV/VCR, stereo/cd, Large deck with table chairs & swing, & fire pit for small campfires. 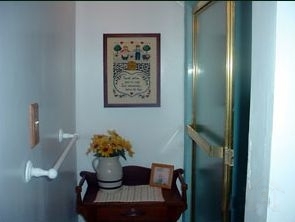 All linens and towels provided. 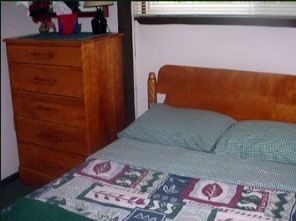 Sleeps 2-6 persons. 1). SMOKING IS PROHIBITED inside the premises rented. Cigarette urns are provided on the deck. (metal pails filled with sand). 3). NO FIREARMS or discharging of any type of weapon or fireworks on rented premises. 5). LOUD MUSIC and excessive noise will not be tolerated. (Day or Night) Please keep in mind that we have neighbors and other guests nearby. 6). SMALL FIRES are permitted in the firepit areas provided. Please use only the wood provided at the firepits. 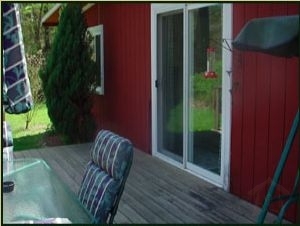 The remaining wood on the porches or on other areas of the property is for inside use only. 7). PLEASE RESPECT our neighbors property (and privacy) by limiting your hikes or ventures to Campbells Hollow property. PROPERTY LINES ARE NOT ALWAYS MARKED. 8). MISREPRESENTATION of the number of occupants staying at rented premises. 9). DAMAGE TO PREMISES OR PROPERTY: In the event Lessee, their guests, family or agents cause damage to Lessor's premises or property, Lessee agrees to pay for the cost of repairs. Lessor agrees to provide an itemized statement of the damage and the cost of repair within thirty (30) days from the last date of occupancy. 10). CHECK IN TIME: After 3:00 p.m. CHECK OUT TIME: 11:00 a.m. VIOLATION OF ANY ONE OF THESE RULES MAY RESULT IN TERMINATION OF YOUR STAY AND LOSS OF RENT. If you should need to cancel a reservation, give us as much notice as possible. We will try to fill those dates and give you a refund. More than 2 weeks, all but $25.00 cancellation fee. 2 weeks to 72 hours prior, 50% cancellation fee. Within the last 72 hours, no refund, 100% cancellation fee. Minimum stay on Holidays may apply. Check in after 3 p.m. Check out 11 a.m.unless prior arrangements have been made. Owner' are on the premises for your assistance. We accept: Visa, Master Card, Novus/Discover.